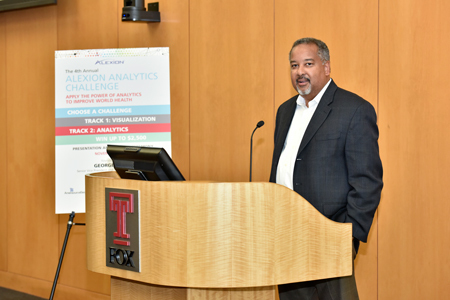 The Institute for Business and Information Technology is proud to announce the winners of The 4th Annual Temple University Alexion Analytics Challenge. 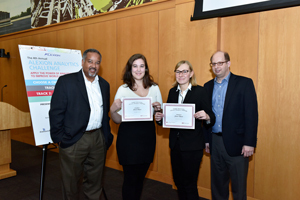 The competition, which was open to all Temple University students and featured problems and data sets from Alexion, AmerisourceBergen, and Merck, culminated on November 16th with final student presentations and an awards ceremony. Students won prizes of $500-$2,500 out of a total pool of $12,000. 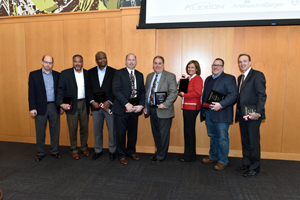 George Llado, Senior Vice President and Chief Information Officer, Alexion Pharmaceuticals, presented the keynote speech and assisted in presenting the awards. Since its inception four years ago, the competition has attracted over 880 entries across the University. In 2016, there were 187 entries from 400 students from schools including Fox, CLA, Engineering, and Tyler. The challenge is offered in cooperation with Office of Senior Vice Provost for Undergraduate Studies and the General Education program. See all of the winners and their projects here.